My fellow Brit WoodenPotatoes put up an interesting (and very well researched) video about what he expects (and in some cases, kinda hopes) to see in Season 2 of the Living World. There are things I agree with and things I don't and I've been tossing this particular post around in my head for a while, so when WP posted his vid I thought it might be about time to try to coalesce those thoughts into some kind of cohesive word structure. I think there are three main threads ANet are going to have to address in the next season, simply because it would leave far too many questions open if they didn't touch on them. In addition to these three main ones, there are innumerable other questions which still remain unanswered from Season 1, and even more which persisted even before the Living World was introduced. I'm only going to cover the biggies in this post though, and they are Lions Arch, Mordremoth and the Black Market Traders. At the end of Season 1 Lion's Arch (LA) is kinda like the ruins of Zanarkand in Final Fantasy 10: a ruin of its former self, it feels more sad than dangerous. Lion's Arch is such an icon for many Guild Wars players, and has been right from the very start of GW:Prophecies all those years ago. LA has been a focal point of trade, community and celebration. Unlike WP, I don't think they'll wait too long before starting the process of rebuilding. For one, I don't believe they could justify it lore-wise: LA has already been re-secured and wrestled from Scarlet's forces; the many thousands of people who lived there and the numerous traders and factions who operated out of the city simply wouldn't stand for it staying a ruin much longer - it's bad for business! But, as WP rightly points out - the Captain's Council, those responsible for running LA, are in ruins themselves. They are without a base of operations and they're battered and bruised. They will probably require assistance to get the city back up and running. I think the rebuilding of Lion's Arch will likely involve some interaction with the Consortium. This shady conglomeration of traders have been actors in the Living World from the start, they were heavily involved with the early parts of the story, but their involvement dropped off as Scarlet became the focus of our attention. I think this kind of operation is exactly the kind of thing they'd like stick their grubby little hands into, and the Captain's Council, under pressure from the traders and factions of LA and without the man-power to do it all themselves, will have to cede a little power and give the Consortium control of the project. I believe it will be up to us as players to gather resources, artisans and, most importantly, gold and bring it to the Consortium who will put it all to work in rebuilding the city. I don't believe this will be plain sailing, and I think this will eventually lead to us discovering a lot more about the Consortium's motivations and ultimate end-game. Additionally, I think that LA will still suffer from the aftereffects of Scarlet's drill boring a hole in the centre of the port and into the ley-lines beneath. We know that the Tengu retreated behind their walls in response to the rise of Zhaitan*, but how long can they stay cooped up (lol, puns) in their fortress now they know that the Elder Dragon has been defeated. It's reasonable to assume that the emergence of Scarlet was further justification (in their eyes) to keep the walls up and the gates closed, but I think now that evil has passed they will be more open to interaction. The rebuilding of LA will require a fresh look at the place, perhaps new materials and new building techniques will lead to a more defensible and efficient city overall. But where might we get these new materials? Perhaps behind the Tengu wall? 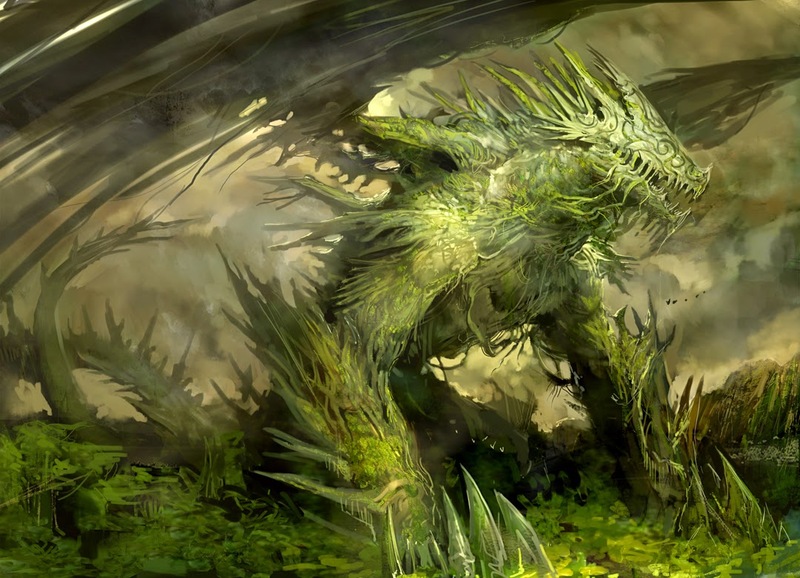 Furthermore, we know that the next big threat that Tyria will face will be the "Jungle Dragon" Mordremoth. It's long been theorised that this dragon will have strong ties to the Maguuma Jungle and so we will be combating this threat in new zones in this area. The Tengu were able to retreat behind their walls because they could shut out the terrors of Zhaitan as he was focused on Orr and the Krytan coasts, but the Jungle Dragon seems to have his eye fixed on Maguuma, which would put the threat much closer to home for the Tengu - maybe even on their side of the wall. 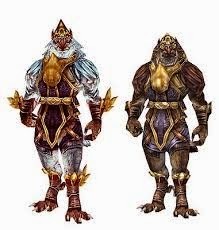 This is more what I'm hoping for, than what I'm expecting: but I hope that Mordremoth begins to threaten the Tengu lands beyond the wall and, seeking help from the rest of Tyria, the Tengu reluctantly open their gates to allow heroes to pass through and assist in the defense efforts. In return for assistance, the Tengu promise to help rebuild Lions Arch with new materials from the Dominion of Winds. Later in the story I don't see why we wouldn't progress further towards the Bloodstone (an incredibly powerful seat of magical power - ie, dragon food), towards the dragon's lair - I think that would be a fascinating story, but for the moment, at least, I hope that we will be able to peak beyond the wall. Right at the end of Season 1, during the celebration at the Dead End Bar in Divinities Reach, we were introduced to a new character: Belinda Delaqua - the sister of the shark-jumping necro Marjory Delaqua. Belinda is a Seraph, and has recently been reassigned to the Brisban Wildlands - a section of the Maguuma Jungle which borders Caledon Forest and Kessex Hills. She has been reassigned from Fort Salma in order to investigate and combat a group of black-market traders who are headquartered in the Wildlands. You don't just drop that kind of Chekhov's Gun without following it up, one would hope. The Brisban Wildlands is already a pretty heavy bandit infested area, so it's not unreasonable to expect some nefarious activity to stem from the zone. Bandits in Lionshead Outcrops can be seen building a bridge leading to a currently unreachable portal - if we eventually gained access to this portal it would lead to an area north of the Wildlands (closer to the Bloodstone etc in the north). It's difficult to say what this storyline might lead to. I think it might eventually lead to an excuse to open up a zone north of Brisban and lead to encountering Mordremoth dragon-spawn further into the Maguuma Jungle. I don't believe, however, that this will happen straight away. I think this will be a parallel storyline to the one leading to the rebuilding of Lions Arch. I think the first parts of Belinda's story will take place in Divinities Reach and Brisban itself, rooting out bandit-holes and secret underground markets. Once the rebuilding of LA has begun in earnest and we start encountering Mordremoth dragon-spawn in the currently existing Maguuma Jungle (and the Dominion of Winds), I think we'll then eventually move through the new portal in the North to combat the HQ of the traders directly. As to who these Black Market Traders are, and what they actually want. Well, it's difficult to say. Nefarious traders screams Consortium to me, but they tend to work out in the open, with a corporate front, rather than in secret. Perhaps it could be less-than-savoury characters scavenging items from the ruins of LA and selling them on in Divinities Reach? Who knows, I'm quite looking forward to being surprised by this storyline... It may even simply be a filler in order to give us something to swing our swords at while they work on the Mordremoth story.